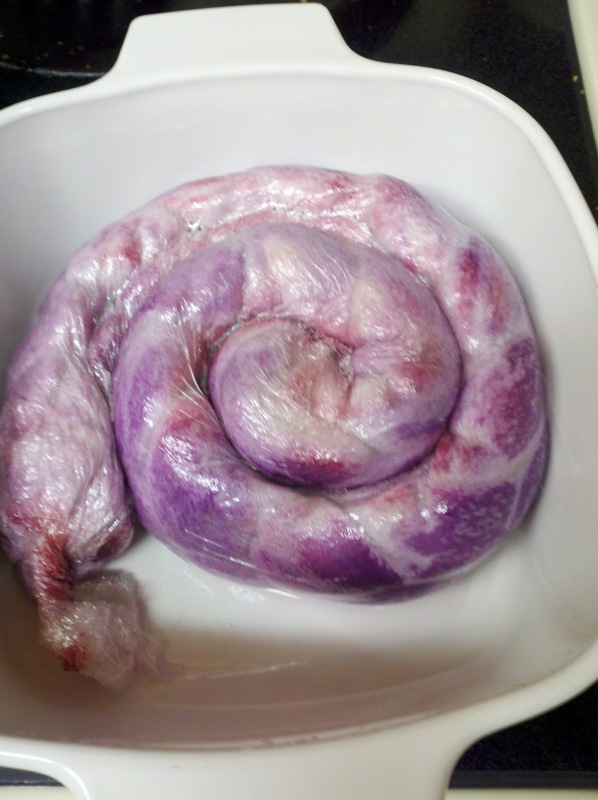 I decided to dye some roving today. So as soon as I got home I pulled my stash bin out from the closet and pulled my Masham and Merino wools out. Fear of ruined counter tops or floor had banished me to the car port during the summer, but with family members still asleep I crafted myself a little work station in the laundry room. I put my jersey-rug down on the floor first, followed by a large double layered piece of cardboard, and then the cling-wrap...which clung to itself marvelously. 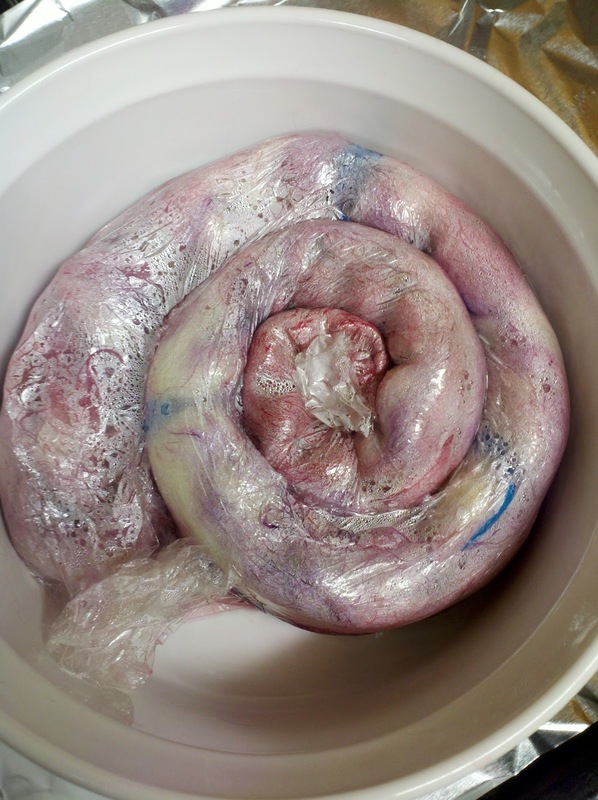 I let the masham wool soak in a bath of vinegar and water first. The roving had been tied off every few inches because I was hoping it would give it a tiny bit of a tie-dye look. I'm sure I've failed miserably with that. Oh well. I turned the single string of merino roving into a braid and while I dyed the masham I let the merino soak. For the masham I dabbed the wine color on with a sponge brush. 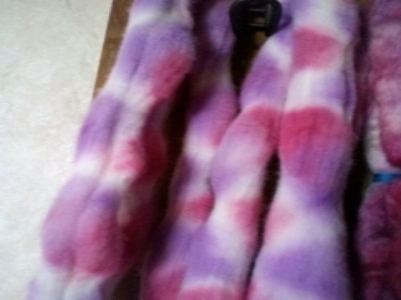 At first I thought about putting it down in particular spots, but then just dabbed quick lines down the roving. If the color went away I bunked the bush back into the cup, and then continued down the line. Mom still had some purple in the little squeeze bottle she had provided, so I simply added more. 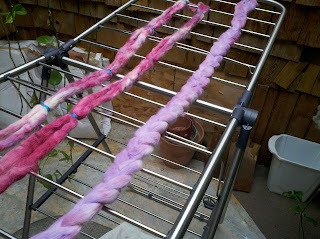 The purple I gently sprinkled all over the roving, not caring where it landed. Both rovings are drying right now. And I can't wait to spin them up. I've never used masham wool before, so it should be interesting. And of course, I'm very excited to see what the colors will look. There is still a 4 oz braid of merino sitting in my stash bin. I wonder what wonderful colors it will adopt. 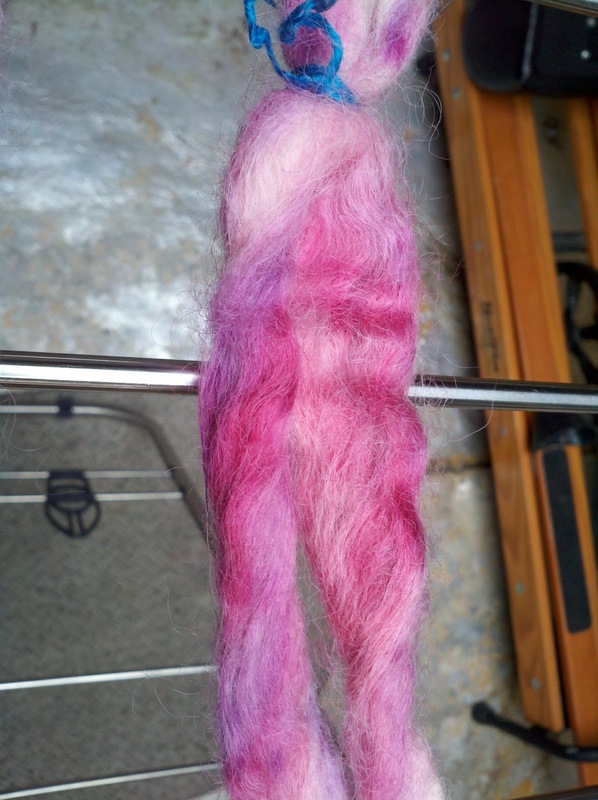 Edit: I unwound the merino braid earlier this morning (02/06/2013) to let the roving dry faster. 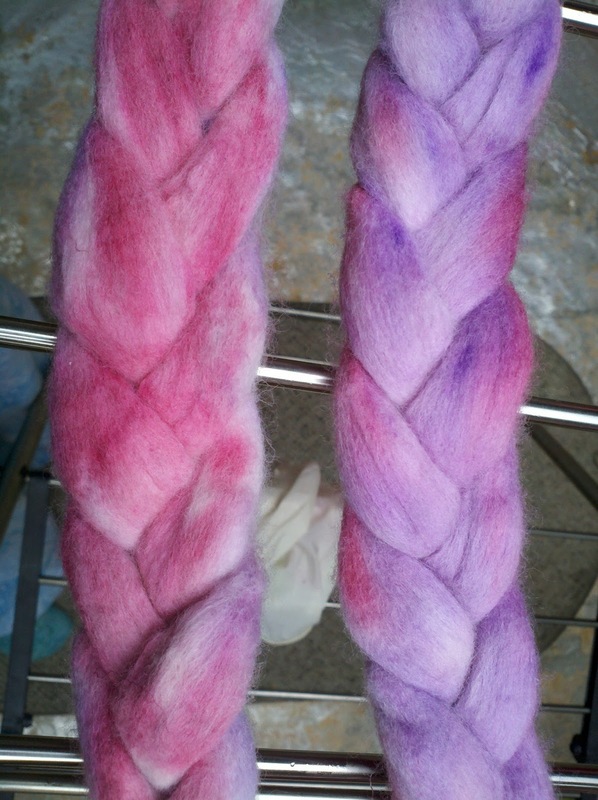 And I just had to share with you all how amazing the merino turned out; in my opinion at least.The purple and pink are made wonderful little speckles all over the white roving. I can't wait to spin this up and see what happens with it. The Masham is quite lovely too. beautiful dye job! i just wanted to let you know the post was up (: thanks again, i really appreciate it!